Author: Anthony R. Benedetto, H.K. Huang, Don P. Ragan, eds. 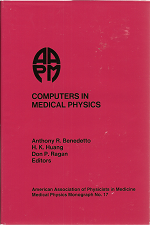 The 1988 AAPM summer school explored how computers were influencing medical physics. Authors of the articles in this book, who were also presenters at the Summer School, were asked to assume that summer school attendees and readers were familiar with computers in general, but were not computer scientists. While computers and software have long since made the tools described in this book obsolete, this text remains a valuable snapshot on what constituted the state of the art in computing for medical physics at this time. Anthony R. Benedetto, H.K. Huang, Don P. Ragan, eds.